S M Ong: JC or poly after O Levels? Or course, JC! The O Level results came out yesterday. So The Straits Times ran this package about the two main routes a student can take after O Levels. I am likely to do well enough to qualify for both the polytechnic and junior college (JC) routes, and I am still undecided between the two. 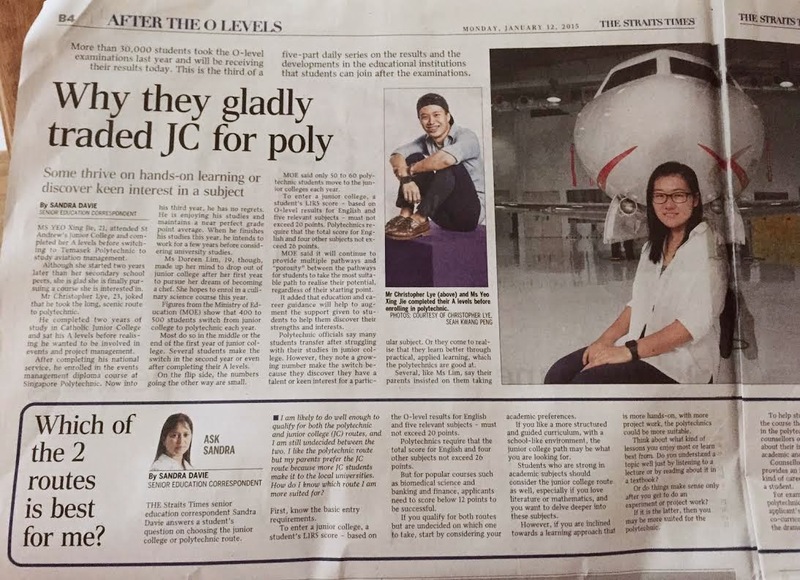 I like the polytechnic route but my parents prefer the JC route because more JC students make it to the local universities. How do I know which route I am more suited for? If you like a more structured and guided curriculum, with a school-like environment, the junior college path may be what you are looking for. Students who are strong in academic subjects should consider the junior college route as well, especially if you love literature or mathematics, and you want to delve deeper into these subjects. However, if you are inclined towards a learning approach that is more hands-on, with more project work, the polytechnics could be more suitable. Think about what kind of lessons you enjoy most or learn best from. Do you understand a topic well just by listening to a lecture or by reading about it in a textbook? Or do things make sense only after you get to do an experiment or project work? If it is the latter, then you may be more suited for the polytechnic. In short, her answer is basically, "It depends on what you like." My daughter is taking her O Levels this year and has asked me which route she should take. I have given her a more definitive answer. I don't care what you like now as a 16-year-old who knows nothing about life. To explain why, let me tell you a bit about my own educational background and experience. After my O Levels, I spent three months in Anglo-Chinese Junior College and could've stayed there and taken my A Levels if I wanted to. But I didn't, mainly because my Chinese sucked. Also, at that time, I was so sick of school (like my son and daughter are now) and just wanted to be done with it as soon as possible. That meant I wasn't interested in going to university. I figured if I went to poly, it would be only three more years of school instead of at least six more years if I go to JC and university. So I went to Singapore Polytechnic and did as terribly as anyone could without actually failing any subject. I got mostly Ds but managed to graduate with a diploma in electronics. After poly, I did my national service. By then, it was clear I sucked at electronics and had better find another career. So to be a journalist, I went overseas to get a journalism degree, spending a lot of my parents' money. Even now, I'm not sure you can get a journalism degree in Singapore. The closest is a mass communications degree. But since I don't have A Levels, it's unlikely I could get into a local university anyway. As it turned out, most of my friends who went to poly also eventually went on to get degrees — some overseas and with a few even getting post-graduate degrees. So if you're going to get a degree after getting a diploma anyway, you might as well take the most direct route to get the degree — by going to JC instead. Yes, yes, I understand that life's a journey and the quickest route may not be the best, but it sure would've saved my parents a lot of money. Do you hear that, Ah Girl?